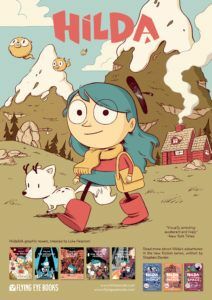 Amazing Hilda posters – Bounce Sales & Marketing Ltd.
Meet Hilda – explorer, adventurer, avid sketchbook-keeper and friend to every creature in the valley! This colourful, fun and detailed poster illustrates all of Hilda’s exciting tales, from both the comics by Luke Pearson, and the new Hilda fiction titles written by Stephen Davies and illustrated by Seaerra Miller. A fantastic way to make sure you never miss out on an adventure!